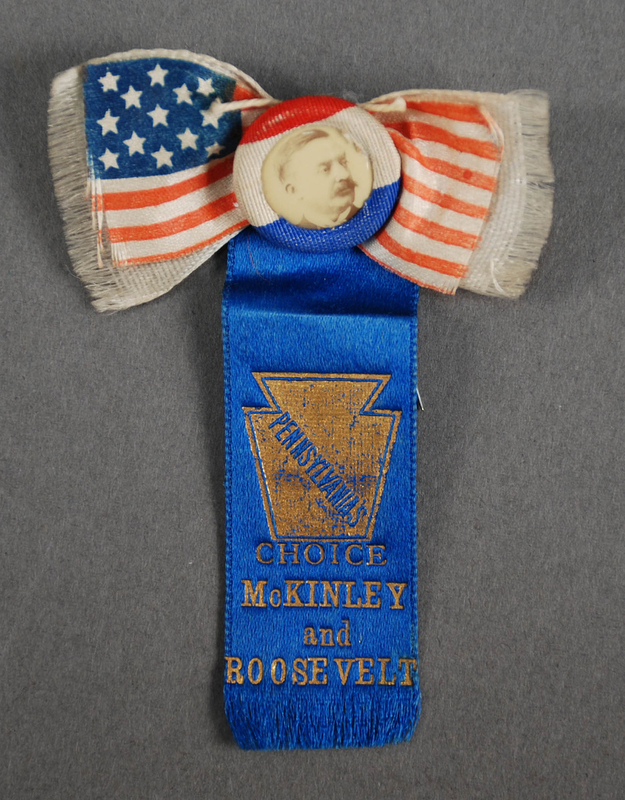 The Elaine B. and Carl Krasik Collection of Pennsylvania and Presidential Political Memorabilia contains thousands of pieces of ephemera that documents more than 200 years of state and national politics. The items range from fabric ribbons to paper election results, sheet music to audio recordings, all created between 1790 and 2014. The materials provide a fascinating connection to the people and issues that defined politics. They track the activities and attitudes of various political parties and government offices, as well as the opinions shared in key debates. 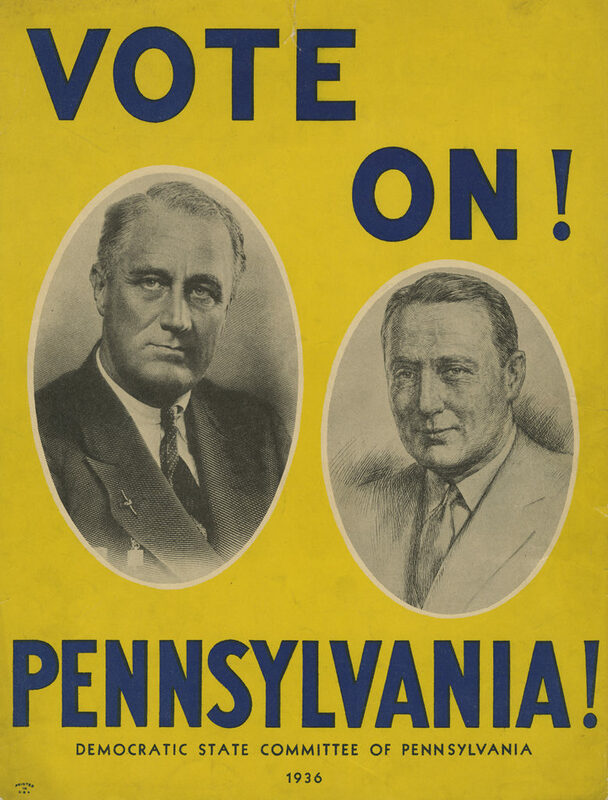 Many of the pieces document American cultural history and demonstrate the connection between Pennsylvania and national politics. Primarily paper-based materials from the collection are housed with the archival collection within the Detre Library & Archives, while three-dimensional objects are stored within the History Center museum collections. 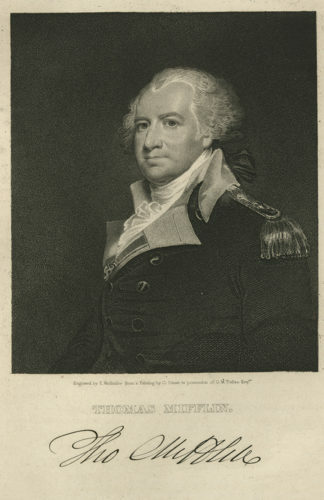 Engraving of Thomas Mifflin, by E. Wellmore, c. 1790. Mifflin became the last to hold the title of President of Pennsylvania and the first to hold the title of Governor of Pennsylvania. This digital exhibit highlights a small sample of the presidential pieces in the Krasik Collection. The items range from 1790 to the presidential election of 2012. Pieces with Pennsylvania connections are highlighted. The twists and turns of Pennsylvania political and presidential history can be traced through these collection materials. For example, we now call the state’s leader the governor, but Pennsylvania’s first Constitution of 1776 gives the title “president” to the head of the state’s executive branch. 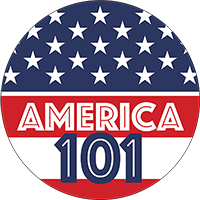 By 1790, the U.S. government had replaced the Articles of Confederation with the Constitution, which resulted in a strong federal government and an executive branch headed by a national president. The creation of a new state constitution brought about the birth of the position of governor in Pennsylvania. An etched portrait in the Krasik Collection depicts Pennsylvania’s last president and first governor, Thomas Mifflin. In another example of the connection between national and state politics, gubernatorial and presidential candidates in the mid-19th century often campaigned in the same year, as the governor’s term lasted only three years. 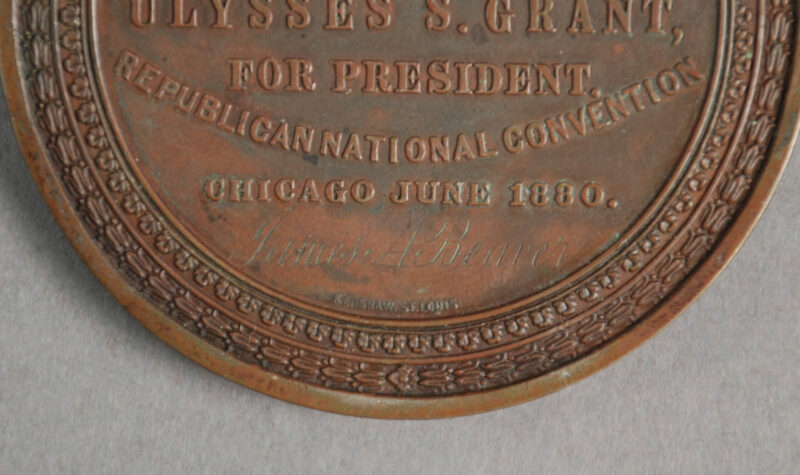 A ribbon for Abraham Lincoln’s 1860 campaign also features future Governor Andrew G. Curtin’s name. Changes made to the state constitution in 1874 established a four-year term for governors with no consecutive terms. This last restriction would be lifted by the passage of the 1968 Constitution. A campaign poster supporting Herbert Hoover for president and various candidates for Pennsylvania offices also documents changes in the political process. In 1913, the 17th amendment to the Constitution passed, which enabled the people to directly elect senators to Congress instead of the state legislatures that elected them previously. 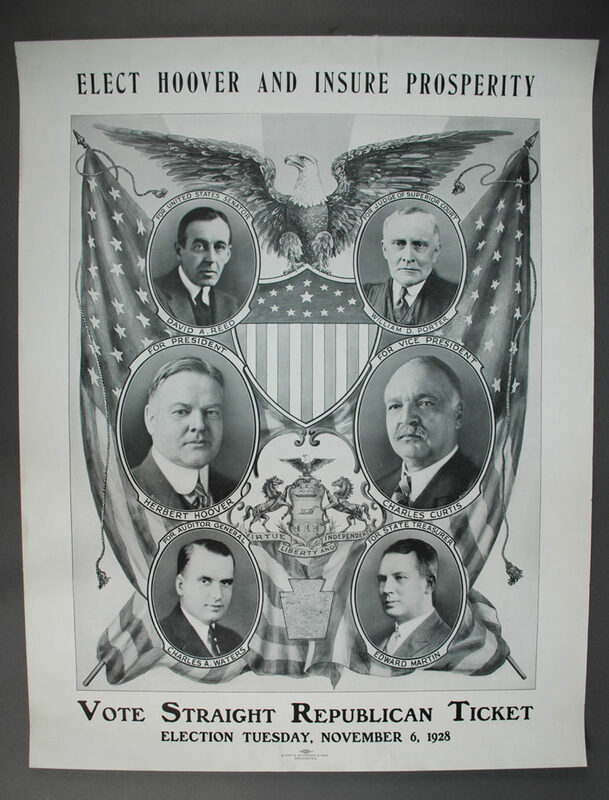 After 1914, presidential and senatorial candidates begin to appear on campaign items together. Look for items with a Pittsburgh connection, including a program from a 1984 Democratic Presidential debate held at the David L. Lawrence Convention Center and a Franklin Delano Roosevelt campaign button from Allegheny County. For more detailed information, please see the archival finding aid for The Elaine B. and Carl Krasik Collection of Pennsylvania and Presidential Political Memorabilia, MSS 1068, or contact museum collections staff. Campaign ribbon supporting Martin Van Buren for President and Richard Johnson for Vice President, 1840. Pennsylvania Governor David Porter, whose term began the previous year, appears on the ribbon, apparently as a way for Van Buren to capitalize on Porter's recent victory. 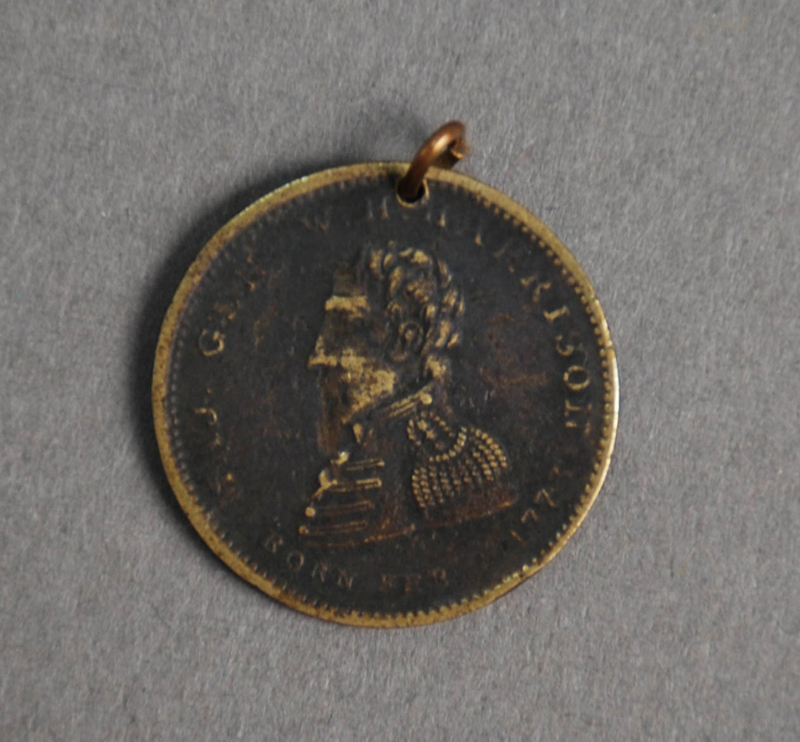 Front of a token supporting William Henry Harrison's presidential campaign, 1840. 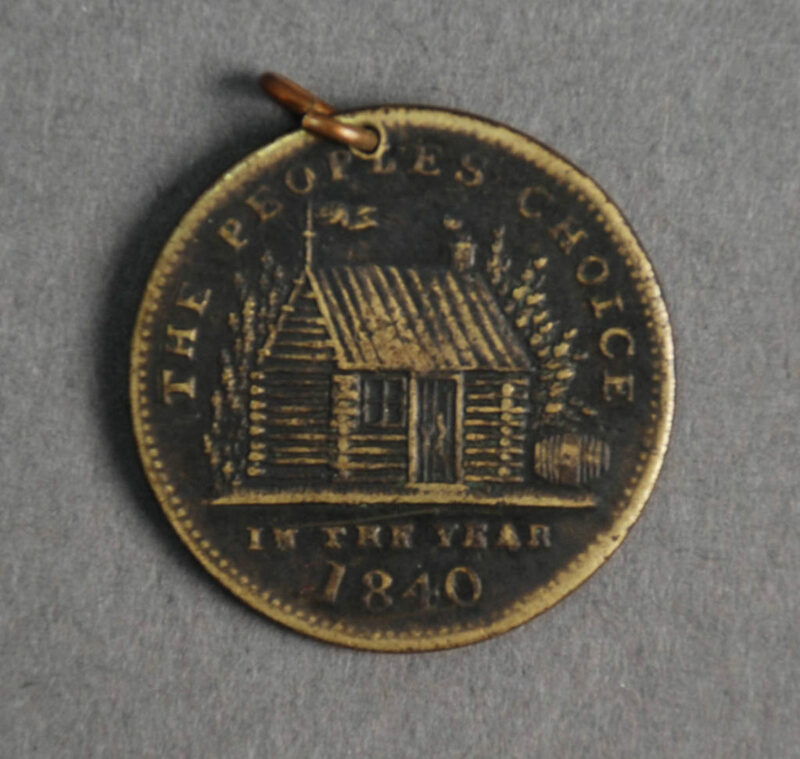 The back of this token has an image of a log cabin, corresponding to Harrison’s "Log Cabin and Hard Cider" campaign. This campaign theme was meant to provoke the image of Harrison as a common, frontier man, a far cry from Harrison's wealthy upbringing. He defeated Van Buren and won the presidency but died after a month in office. 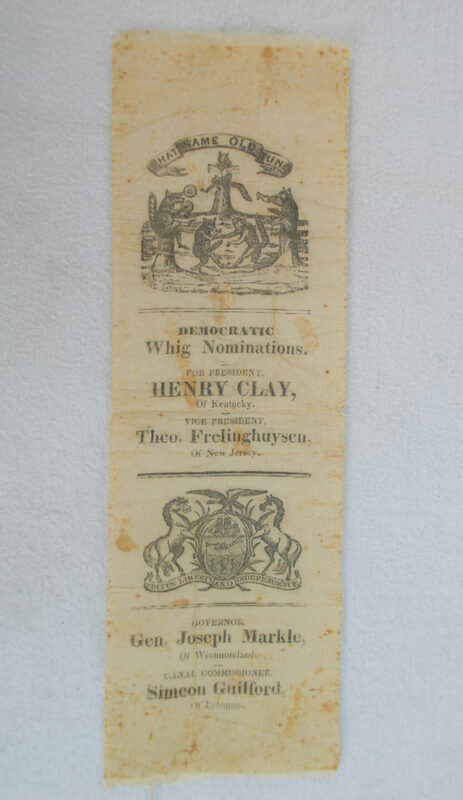 Campaign ribbon supporting Henry Clay for President, Theodore Frelinghuysen for Vice President, Joseph Markle for Governor of Pennsylvania, and Simeon Guilford for Pennsylvania Canal Commissioner, 1844. 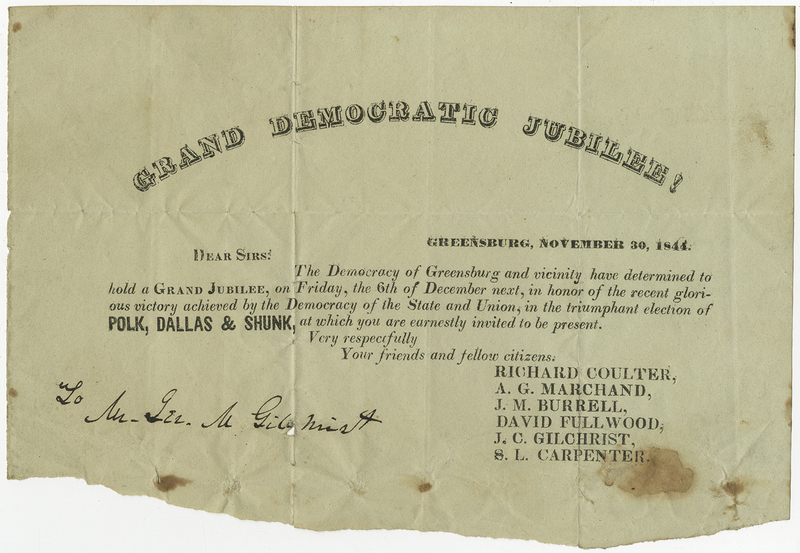 Announcement of a Greensburg, Pennsylvania celebration honoring the election of Polk, Dallas, & Shunk, 1844. 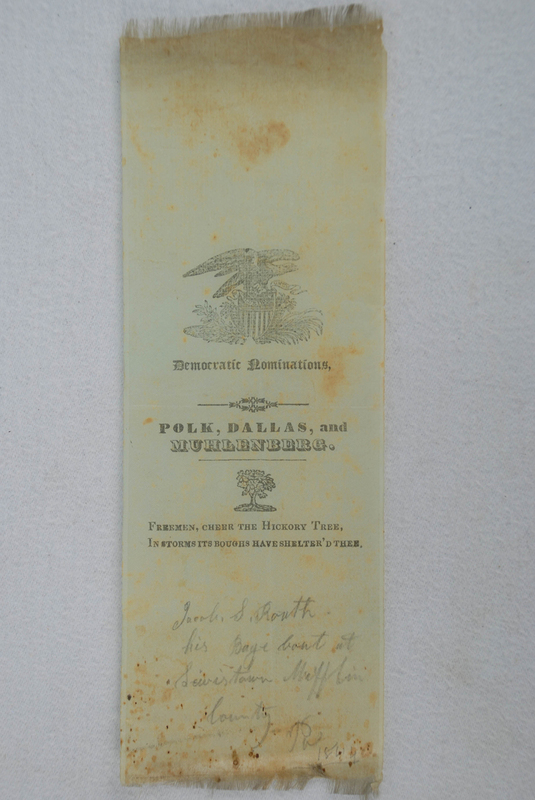 Campaign ribbon supporting James K. Polk for President, George Dallas for Vice President, and Henry Muhlenberg for Governor of Pennsylvania, 1844. Muhlenberg died just a few months before the election, and Francis Shunk took his place, winning the election. The hickory tree appears to be a connection to Polk's mentor, Andrew Jackson, known as "Old Hickory." There is a handwritten note at the bottom that reads "Jacob S. Roath [or Routh] this Bage [badge] bout [bought] at Lewistown Mifflin County Pa 1844." Announcement for June Convention featuring The People's Candidates and Presidential hopeful Henry Clay, c. 1844. This paper ribbon would likely have been distributed for a Pennsylvania county Whig Convention. The ribbon has the Whig raccoon symbol and supports Clay for President, Frelinghuysen for Vice President, and Markle for Governor. It also features Whig support of a protective tariff. Clipping, Democratic electoral Ticket printed in The Standard, 1848. Clipping, Democratic nominations printed in Daily Morning Post, 1852. 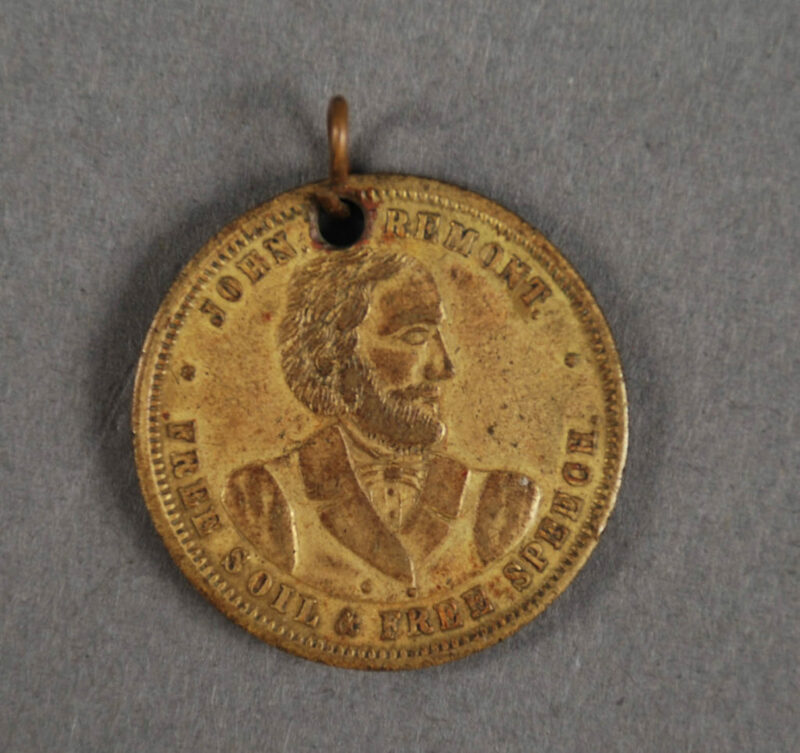 This token is from John C. Fremont's 1856 nomination as the first Republican candidate for President. Following the dissolution of the Whig Party and the growing tensions over slavery, the Republican Party began to take shape as debates over the extension of slavery into new territories began. Pittsburgh has an interesting connection to the founding of the Republican Party; in February 1856, an "informal convention" was held at Lafayette Hall in Pittsburgh "for purposes of perfecting the National Organization, and providing for a National Delegate Convention of the Republican Party...to nominate candidates for the Presidency and Vice Presidency" for the 1856 election (Pittsburgh Gazette, February 22, 1856). At the formal Republican Convention, held in Philadelphia that same year, Fremont was nominated as the Party’s candidate. He lost the election, but paved the way for Abraham Lincoln's victory in 1860. 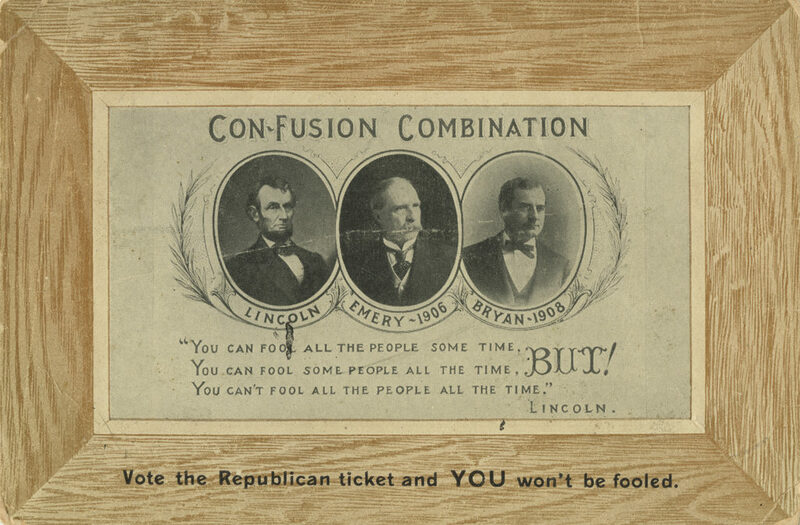 Campaign ribbon supporting Abraham Lincoln for President, Hannibal Hamlin for Vice President, and Andrew G. Curtin for Governor, 1860. Correspondence from Russell Errett to James A. Beaver, September 3, 1872. 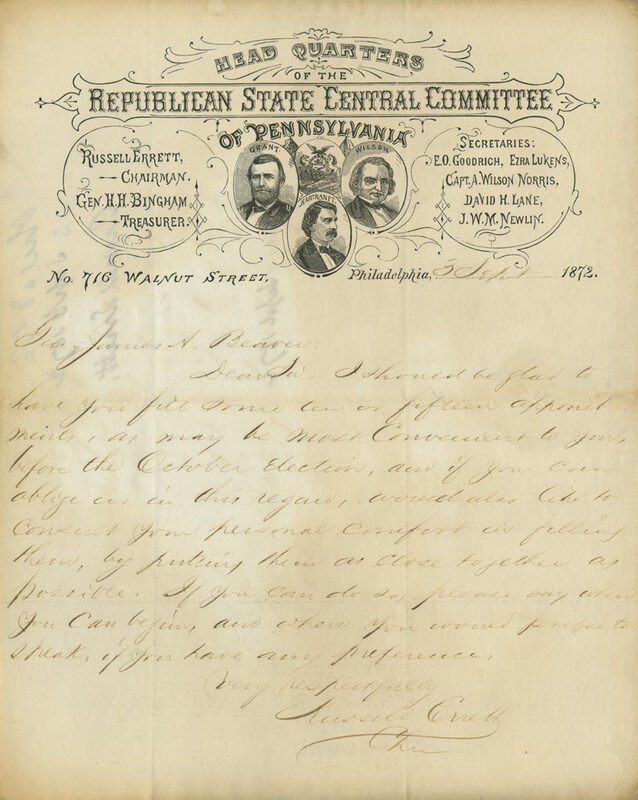 This letter from Russell Errett, Chairman of the Republican State Central Committee of Pennsylvania, to James A. Beaver, elected Governor of Pennsylvania in 1886, discusses the process of selecting Pennsylvania representatives to the Republican National Convention that year. The letterhead pictures President Grant, Vice Presidential candidate Wilson, and Gubernatorial candidate Hartranft. Commemorative Medal, 1881. 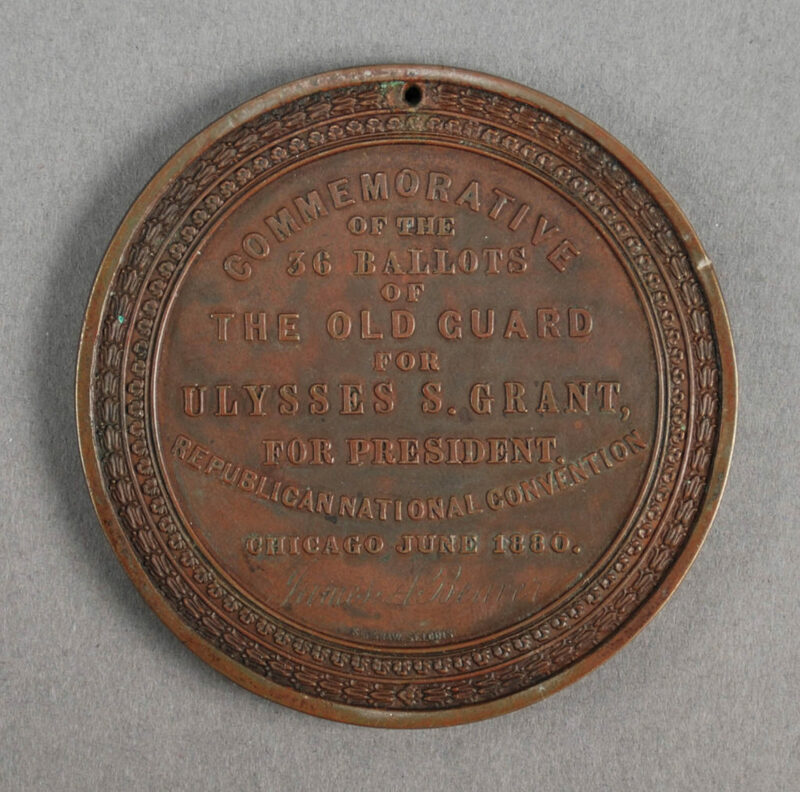 This medal honors the "The Old Guard" votes for Ulysses S. Grant during his third run for office at the 1880 Republican National Convention, unprecedented at this time in American political history. The Republican Party had split into two rival factions, "The Stalwarts" who supported patronage within politics, and "The Half-Breeds", who supported the merit system. Grant was backed by the Stalwart faction of the party, while James G. Blaine was the Half-Breeds’s candidate. In the end, James A. Garfield was nominated as a compromise candidate and went on to win the presidency. Commemorative Medal, 1881. This medal acknowledges the 306 delegates from the Stalwart faction, or “Old Guard,” of the Republican Party that supported Grant during the convention. Commemorative Medal, 1881. This piece is notable for the inscription of James A. Beaver's name, leader of the Pennsylvania delegates at this convention and future Governor of Pennsylvania. 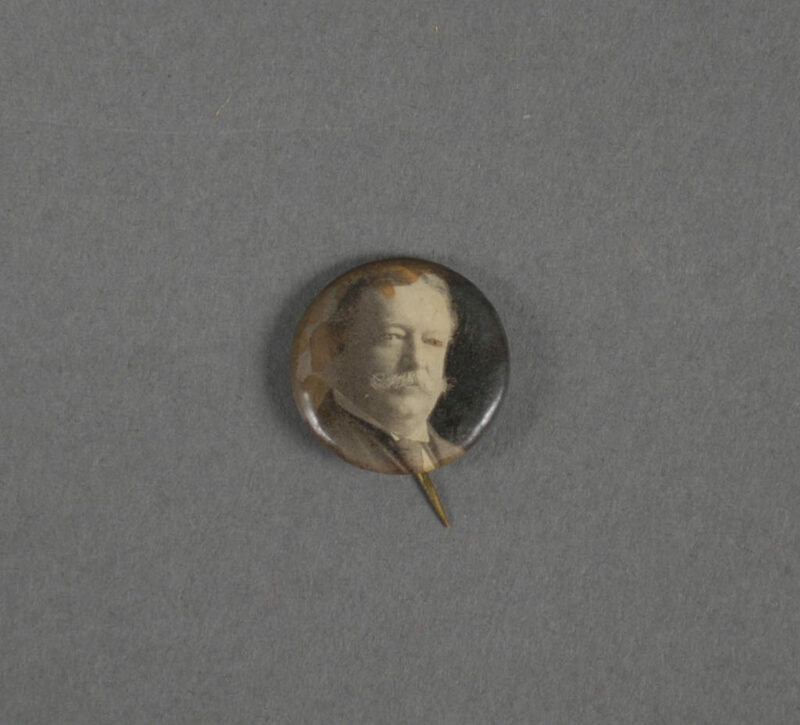 Campaign badge, supporting William McKinley and Theodore Roosevelt, with a button featuring image of Pennsylvania Senator Matthew Quay, c. 1900. Quay was a particularly influential, powerful, and controversial politician from Beaver, Pennsylvania, apparently called a "kingmaker" by President Benjamin Harrison. Campaign token, 1904. A familiar souvenir to us today, the elongated coin appears to have been issued as far back as the 1893 Columbian Exposition. The "Indian Head Penny" on which this design was pressed circulated throughout the latter half of the 19th Century, until the Lincoln Cent replaced it in 1909. 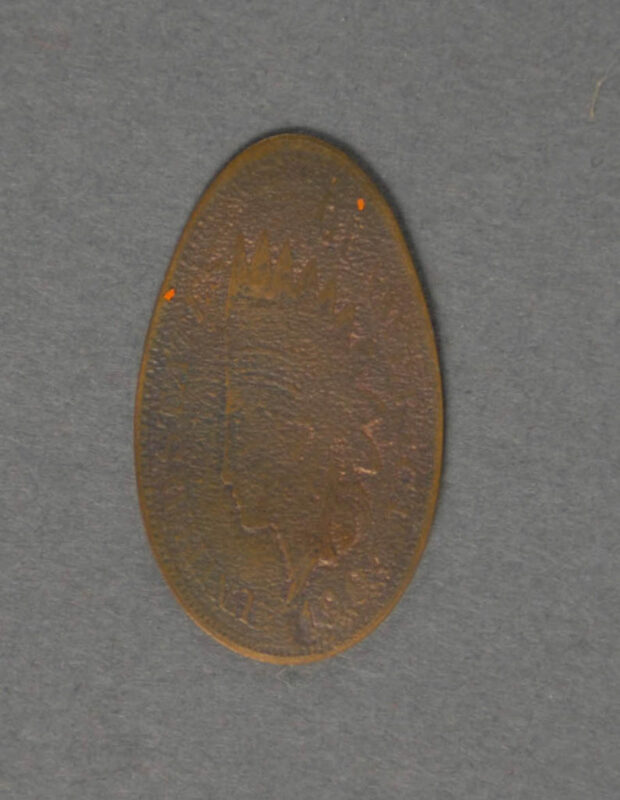 This particular penny supports Theodore Roosevelt for President in 1904; one can faintly make out the image of Liberty wearing a Native American headdress on the back. Campaign token, 1904. This particular penny supports Theodore Roosevelt for President in 1904; one can faintly make out the image of Liberty wearing a Native American headdress on the back. Postcard, 1906. 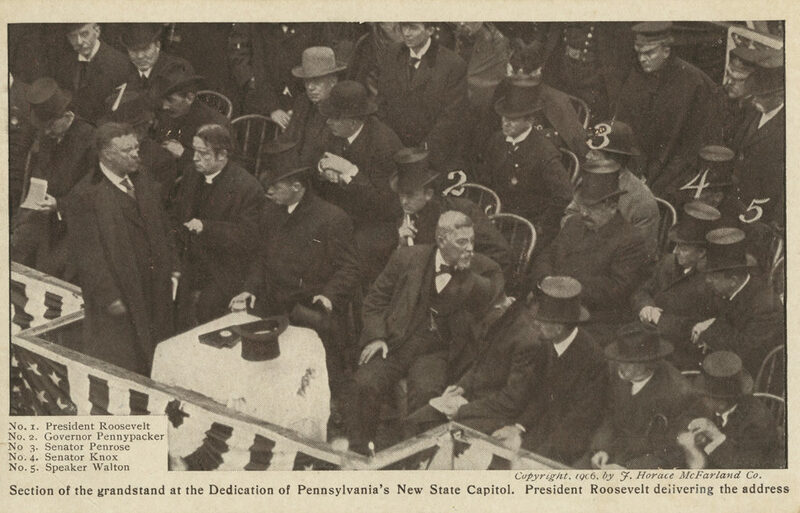 Elected in 1904, President Theodore Roosevelt can be seen here delivering an address during the dedication of Pennsylvania’s new State Capitol in 1906. Political button supporting William Howard Taft, manufactured by Whitehead & Hoag Co., c. 1908. 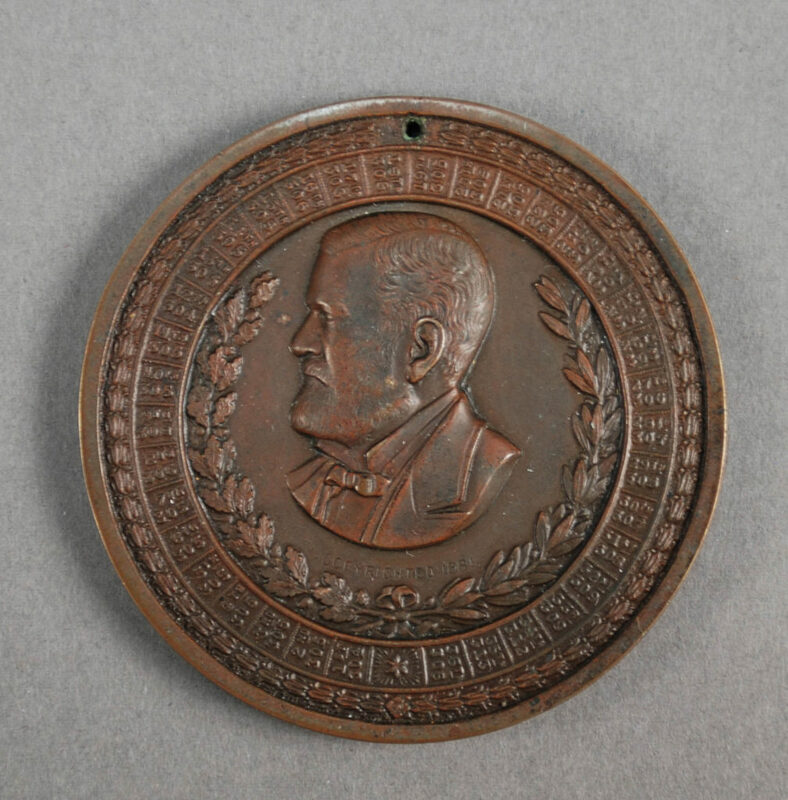 This button most likely dates to Taft’s successful 1908 Presidential campaign. Campaign postcard featuring Lewis Emery for Pennsylvania Governor in 1906 and William Jennings Bryan for United States President in 1908, postmarked 1906. Political button supporting the Bull Moose Party or Progressive Party, c. 1912. Theodore Roosevelt spearheaded this Third Party in the election of 1912. 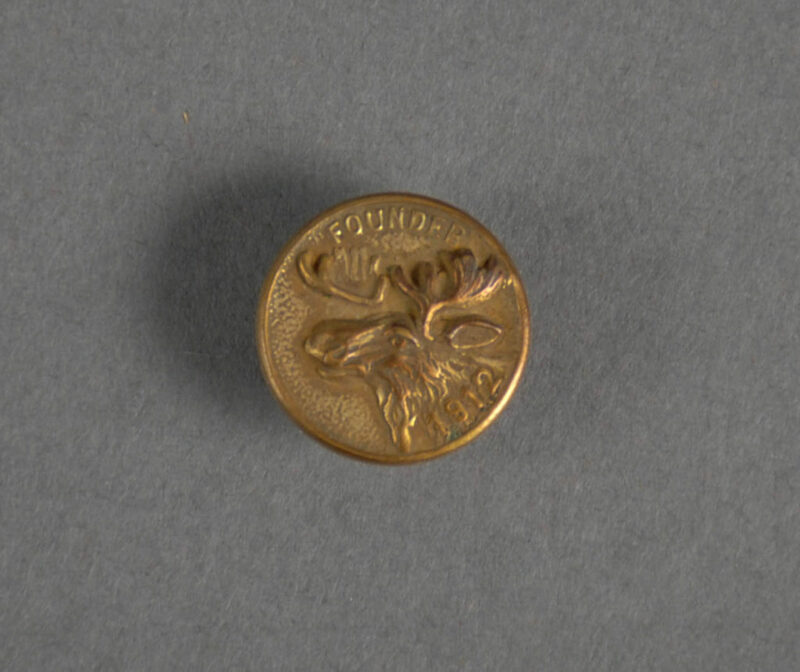 The button reads "FOUNDER" and depicts a moose. 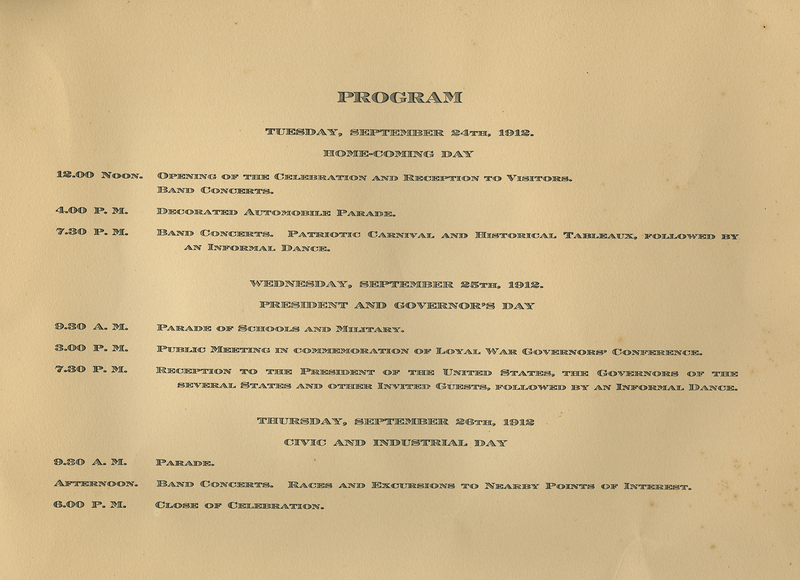 The Loyal War Governors’ Conference 50th anniversary program, page 2. 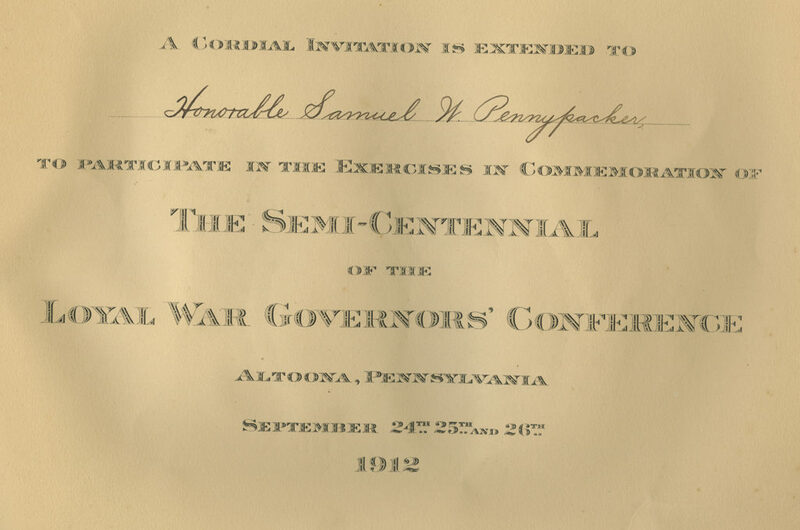 The Loyal War Governors’ Conference 50th anniversary program, 1912. 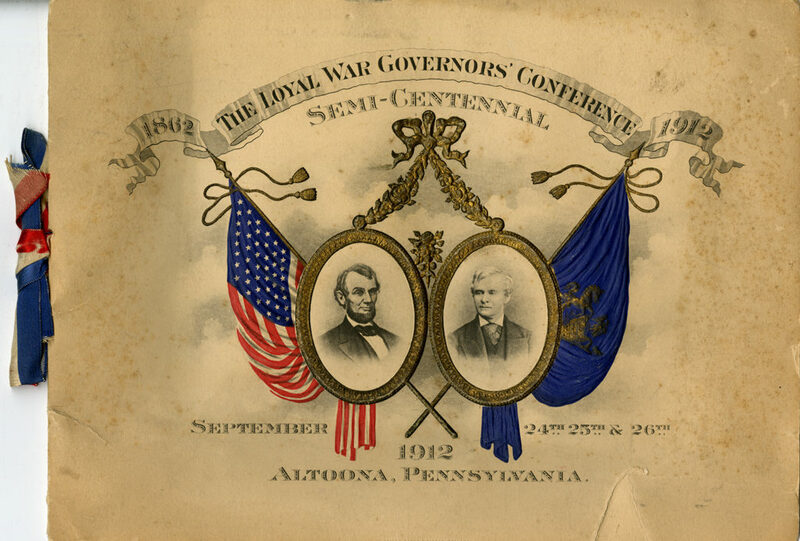 Thirteen governors of Union states came together to support the policies of President Abraham Lincoln at the first Loyal War Governors' Conference in Altoona, Pennsylvania in 1862. This program for The Loyal War Governors’ Conference documents the events held in commemoration of the 50th anniversary of that meeting. Although held during an election year, President Howard Taft attended the event. The Loyal War Governors’ Conference 50th anniversary program, page 3. Postcard, 1918. This postcard lists the Democratic candidates to vote for in a 1918 primary election. Text in the lower left corner instructs recipients to take the card with them to their polling place. 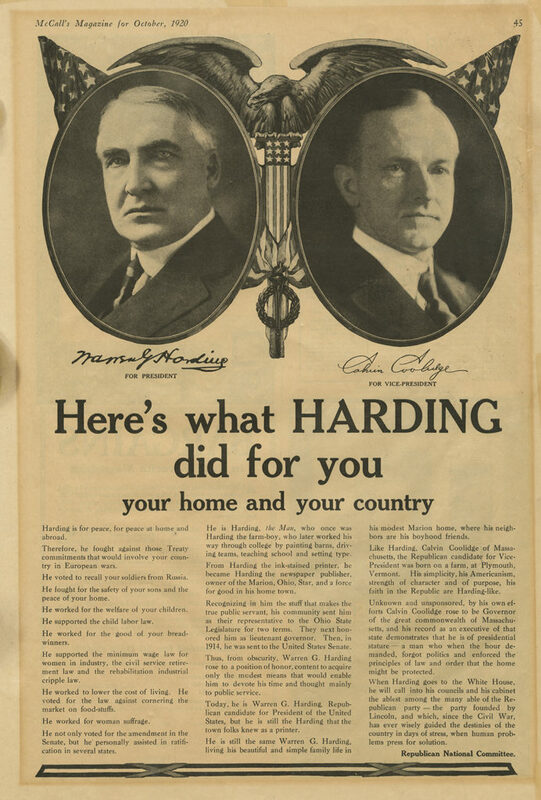 This advertisement from McCall's Magazine highlights Warren G. Harding's domestic policies during his run for President in 1920. 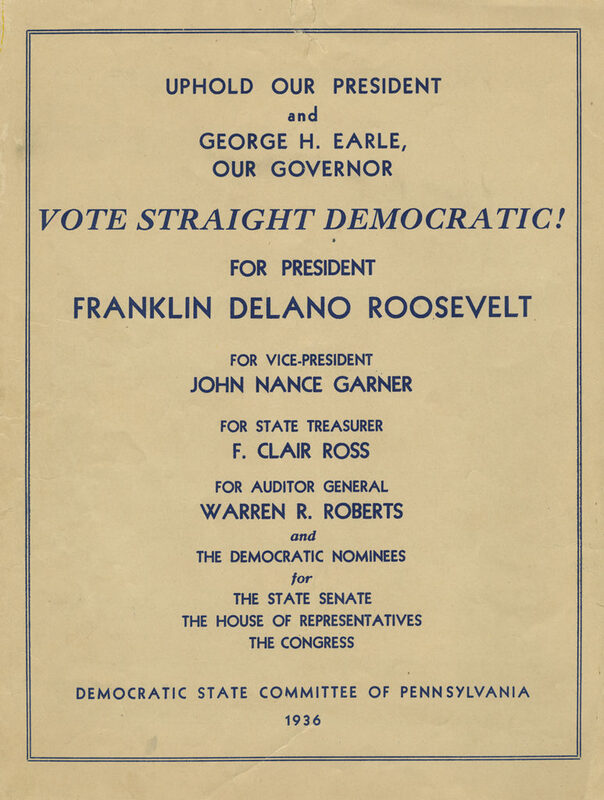 Campaign poster for Herbert Hoover's presidential election and Pennsylvania candidates for office, 1928. Campaign Button supporting Franklin Delano Roosevelt for President, c. 1936. 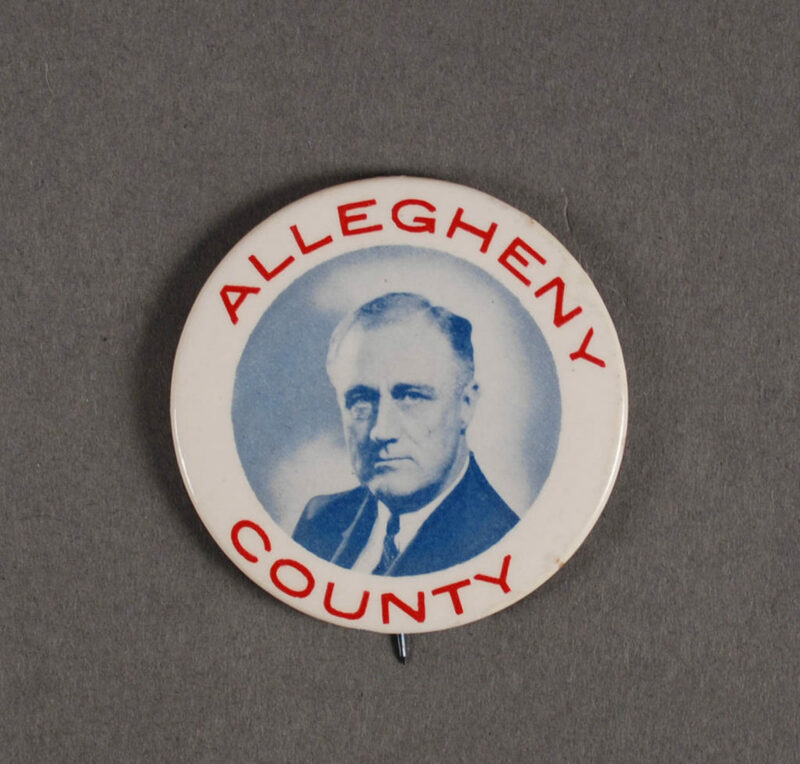 A campaign button from Allegheny County, Pa., supporting Franklin D. Roosevelt. 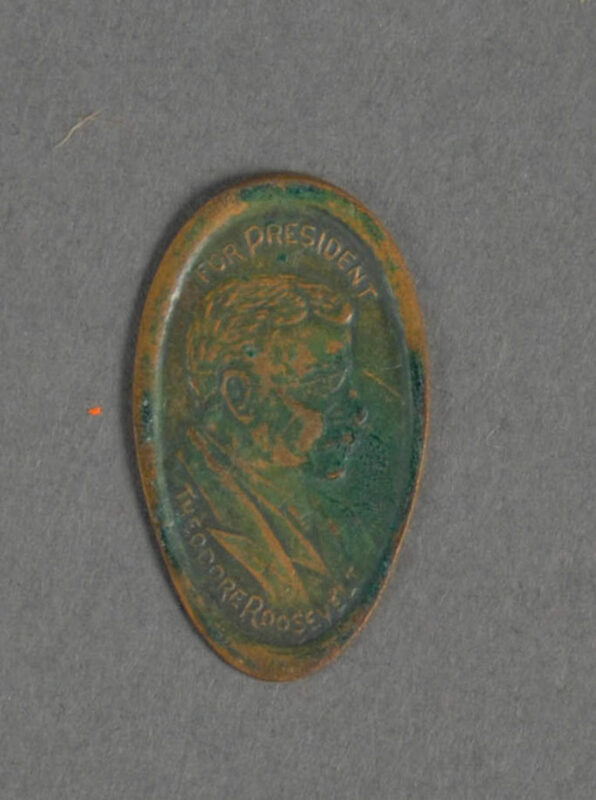 The button is not specifically dated with any of the four successful campaigns Roosevelt ran in, but the younger image of him and the fact that he is not specifically named on the button, implying he is already well-known, indicates that this is likely a re-election piece from 1936. The 22nd Amendment, passed by Congress in 1947 and ratified by the states in 1951, limited the number of terms a President could serve to two. Roosevelt is the only President to have served more than two terms, serving a total of twelve years before his death in office in 1945. 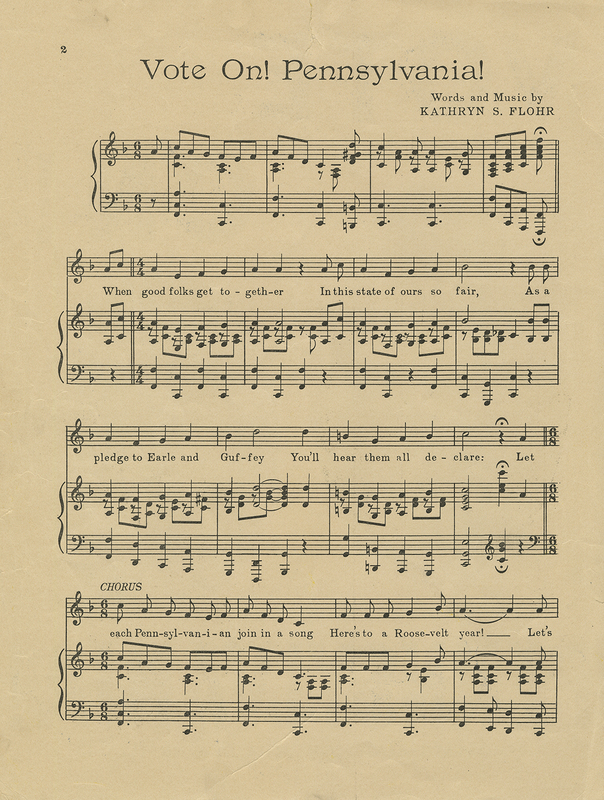 Campaign sheet music, 1936, distributed by the Democratic State Committee of Pennsylvania this sheet music encouraged citizens to "Vote On! Pennsylvania!" Vote On! Pennsylvania!, 1936, page 3. Vote On! Pennsylvania!, 1936, page 2. Vote On! Pennsylvania!, 1936, back cover. Sample ballot for Dwight D. Eisenhower, 1954. 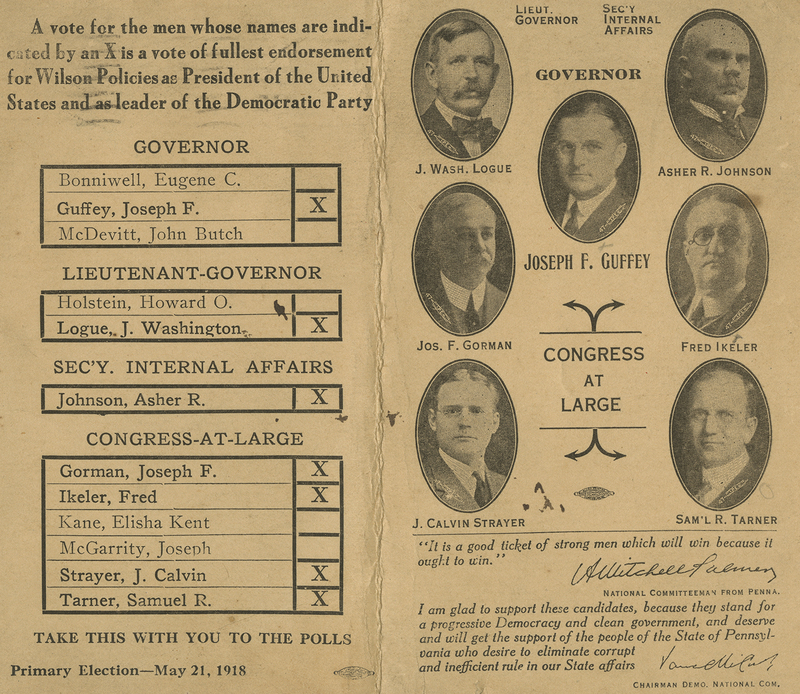 This official Eisenhower sample ballot lists James Duff of Pennsylvania for U.S. Senator. 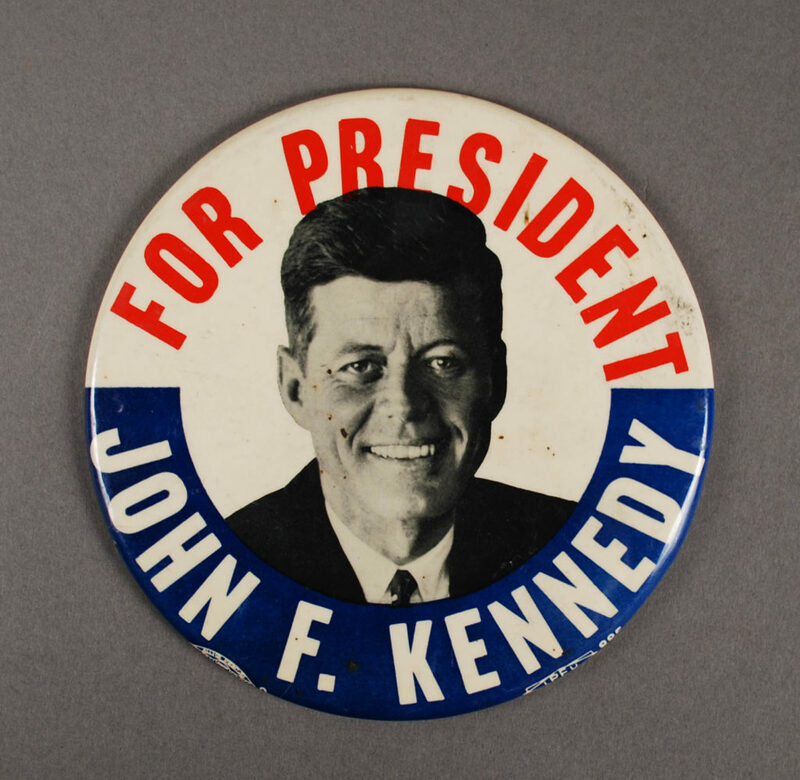 Campaign button supporting John F. Kennedy for President, c. 1960. 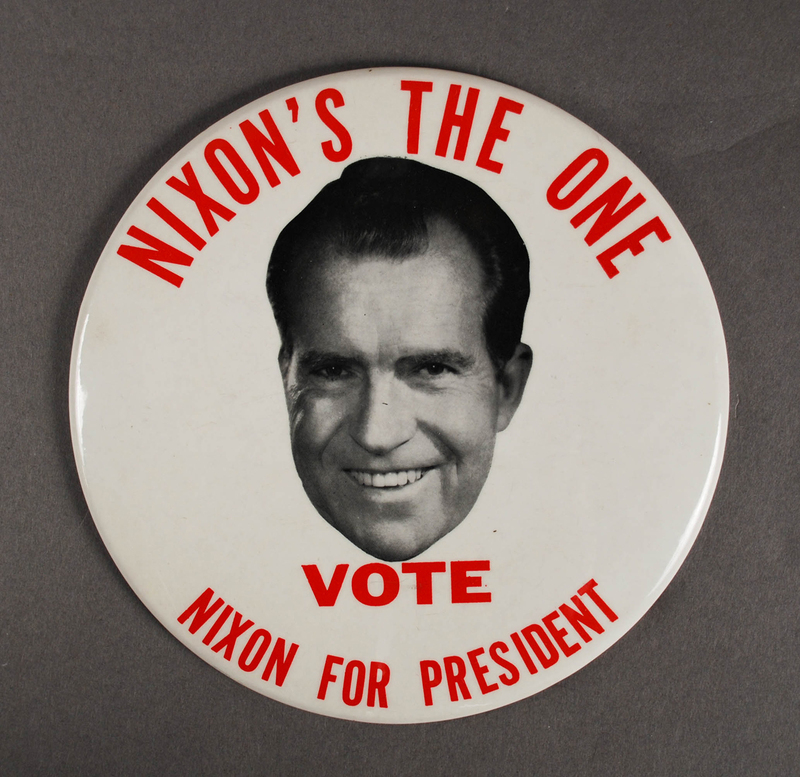 Campaign button, manufactured by Platt Amusement Company, Pittsburgh, Pa., c. 1968. 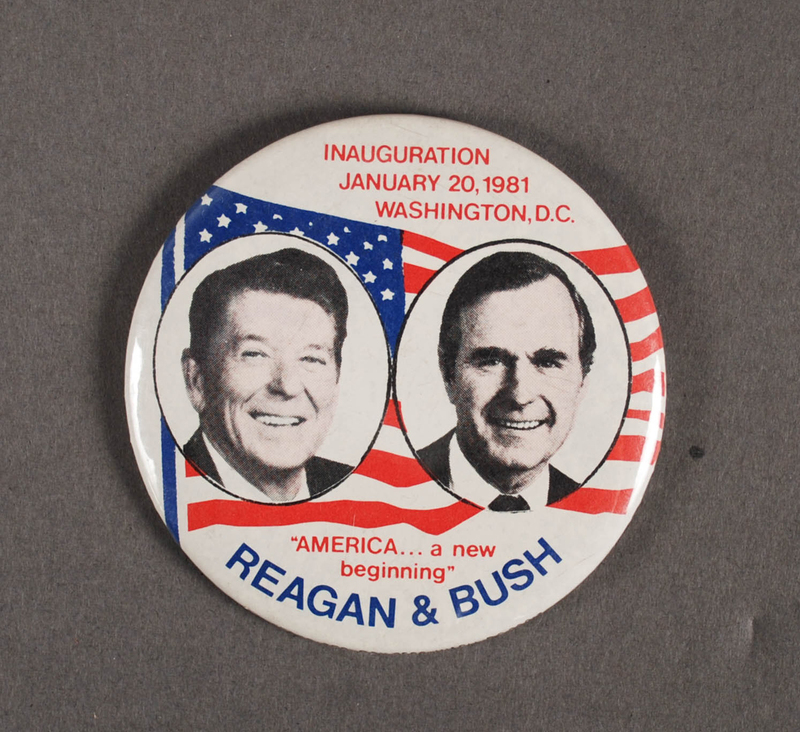 Political button from Ronald Reagan and George H. W. Bush's inauguration, made by Jed Enterprises, January 1981. 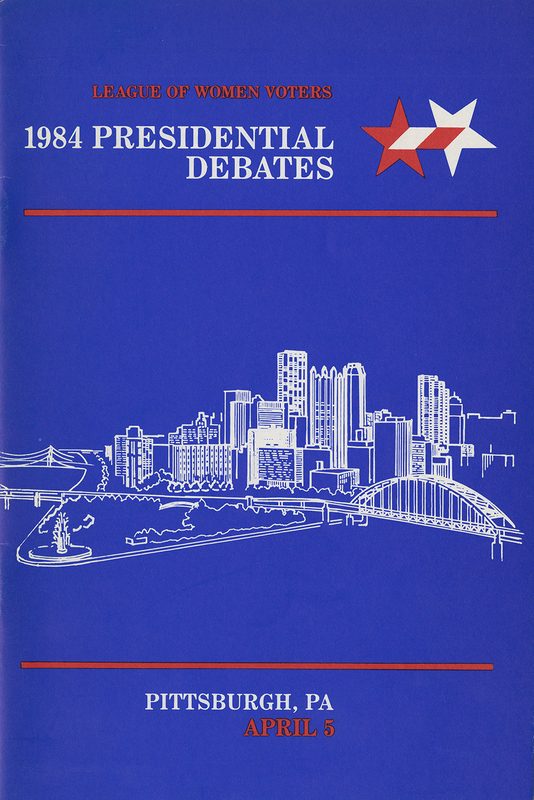 Democratic Presidential debate program, 1984. 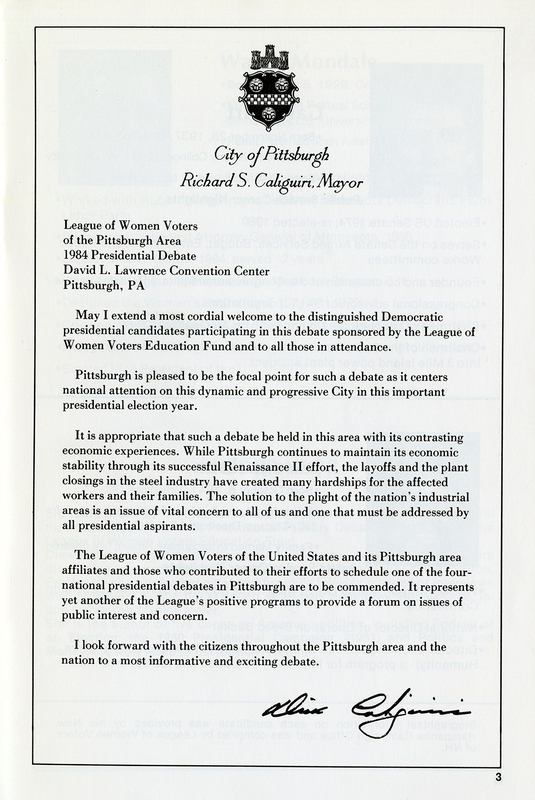 A debate between Democratic candidates was sponsored by the League of Women Voters and held at the David L. Lawrence Convention Center, Pittsburgh on the eve of the Pennsylvania primary, 1984. 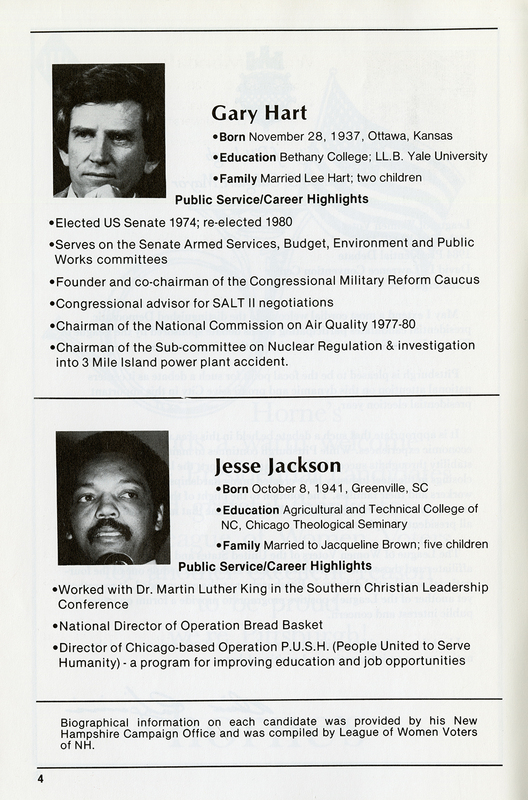 Democratic Presidential debate program, 1984, page 2. Democratic Presidential debate program, 1984, page 3. 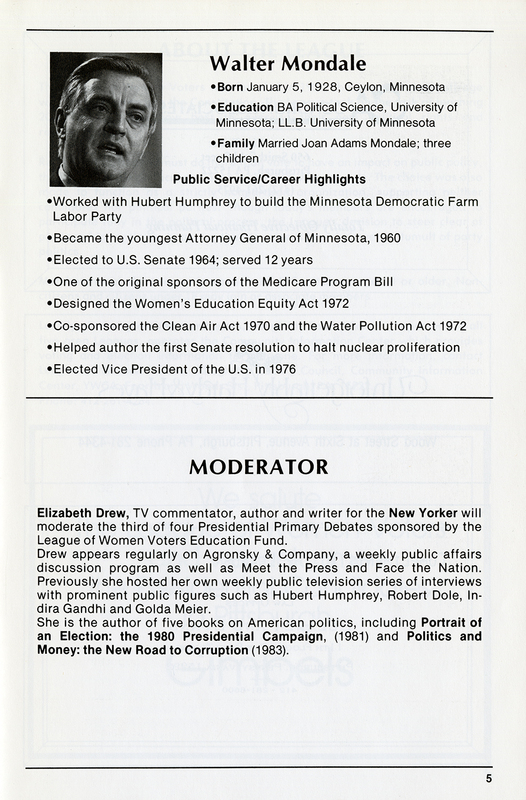 Democratic Presidential debate program, 1984, page 4. Democratic Presidential debate program, 1984, page 5. Campaign button, made by Bold Concepts 1992. Made for George H.W. 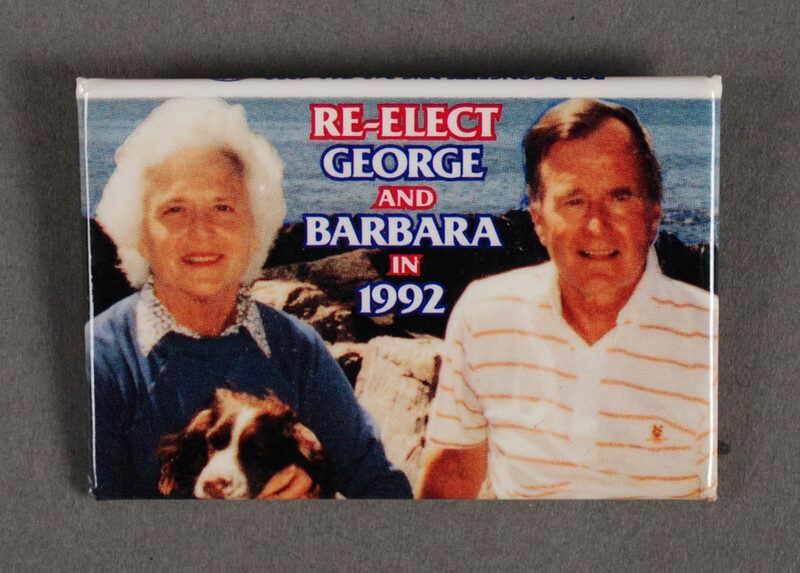 Bush's unsuccessful re-election this button features photographs of the President, First Lady Barbara Bush, and their dog, Millie. 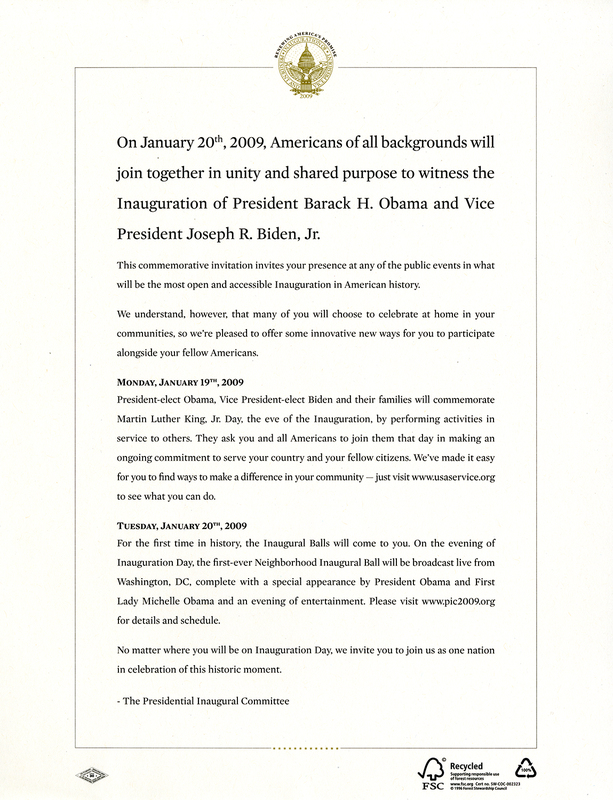 This commemorative invitation to the 56th presidential inauguration in 2009 provided details for this inaugural ball, the first to be broadcast online. 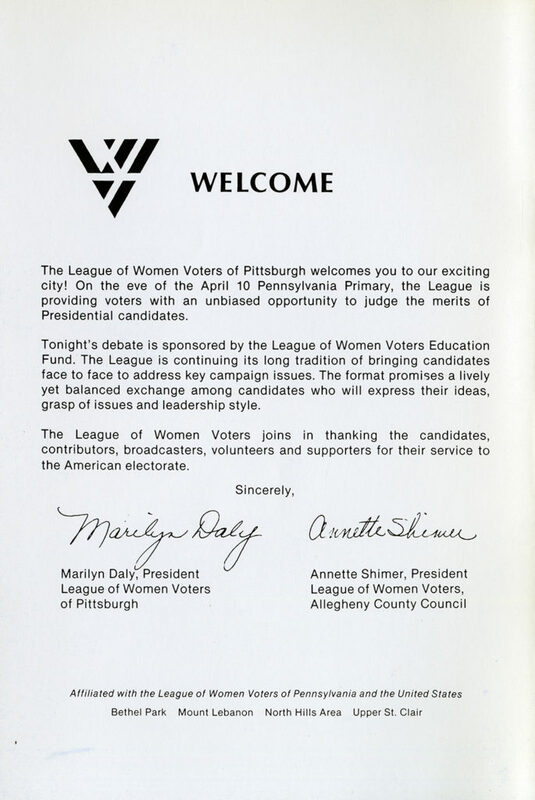 Advertisement listing Allegheny County Democratic Candidates for General Election Day, Tuesday, November 6, 2012. 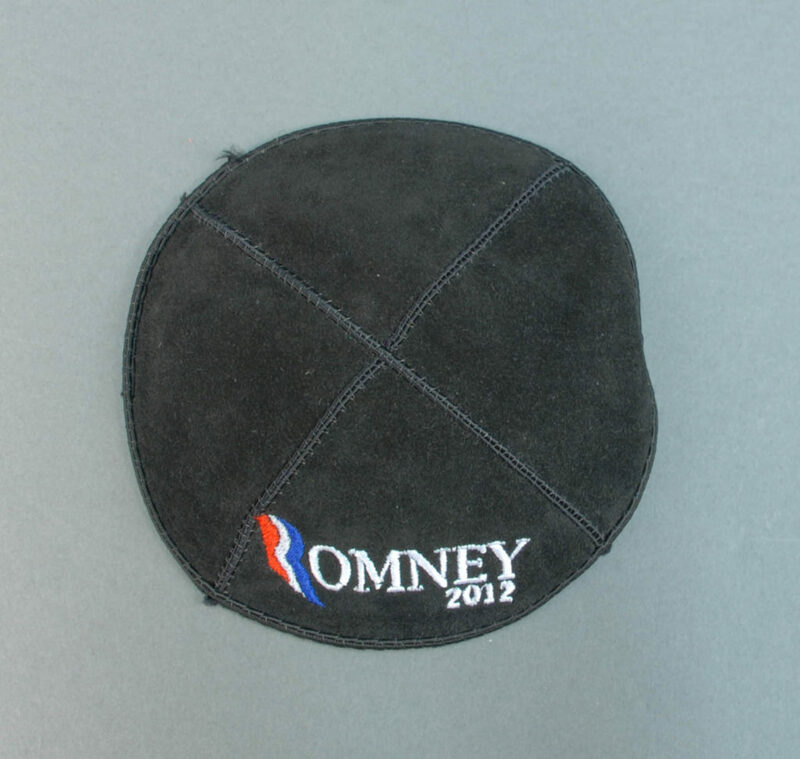 Yarmulke supporting Mitt Romney in the presidential election, 2012. See more pieces from the Krasik collection on our blog. “James Addams Beaver.” Pennsylvania Historical & Museum Commission. Accessed 9/17/2016. 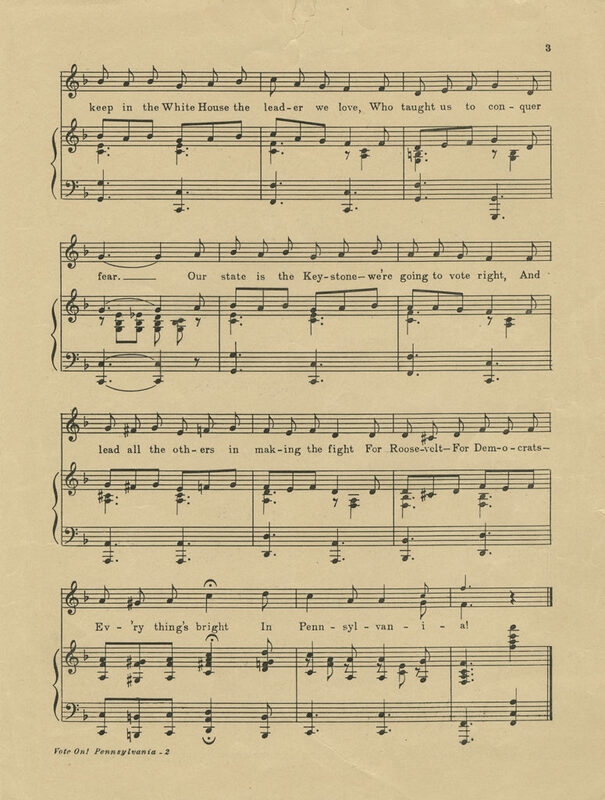 “‘Get Out the Vote:’ Campaigning for the U.S. Presidency.” Division of Rare & Manuscript Collections, Cornell University. “Lincoln Penny.” United States Mint. Accessed A8/30/16. “James A. Garfield: Campaigns and Elections.” The Miller Center. Accessed 8/30/16. Snyder, Charles McCool. The Jacksonian Heritage Pennsylvania Politics, 1833-1848. Harrisburg: The Pennsylvania Historical and Museum Commission, 1958. “Old time notes of Pennsylvania: a connected and chronological record of the commercial, industrial and educational advancement of Pennsylvania, and the inner history of all political movements since the adoption of the constitution of 1838,” A. K. McClure. “Elections in Pennsylvania: A Century of Partisan Conflict in the Keystone State,” Jack M. Readway. Andrew T. Fenrich Papers and Photographs, c1943-c1980, MSS 0767, Detre Library & Archives at the Heinz History Center. Catherine Baker Knoll Papers and Photographs, 1940-2008, MSS 0766, Detre Library & Archives at the Heinz History Center. Mark Pollock Papers, 1986-1989, MSS#526, Rauh Jewish Archives, Detre Library & Archives at the Heinz History Center. Diaries of Robert McKnight, 1839-1847, MSS #176, Detre Library & Archives at the Heinz History Center. Gregg L. Neel Papers, 1873-1883, MSS# 140, Detre Library & Archives at the Heinz History Center. Scrapbooks of John Dalzell, 1886-1911, MSS #175, Detre Library & Archives at the Heinz History Center. Scrapbooks of Thomas J. Gallagher, 1932-1969, MSS #279, Detre Library & Archives at the Heinz History Center.